Quick, easy and oh-so-flavorful, these cold vegetable pizza bites are a classic party food that also tastes great as a fun family meal. I can remember the first time I tried a cold vegetable pizza recipe like this one. It was when I was about six years old, and admittedly, the idea of crunching on fresh veggies didn’t seem like the best one to me at the time! However, one bite and I was hooked. I mean, who can beat a pizza that has a crust made of crescent rolls, “sauce” made from cream cheese and ranch, and cold, crisp toppings? When I think of a cold vegetable pizza, I usually think of family functions or parties. 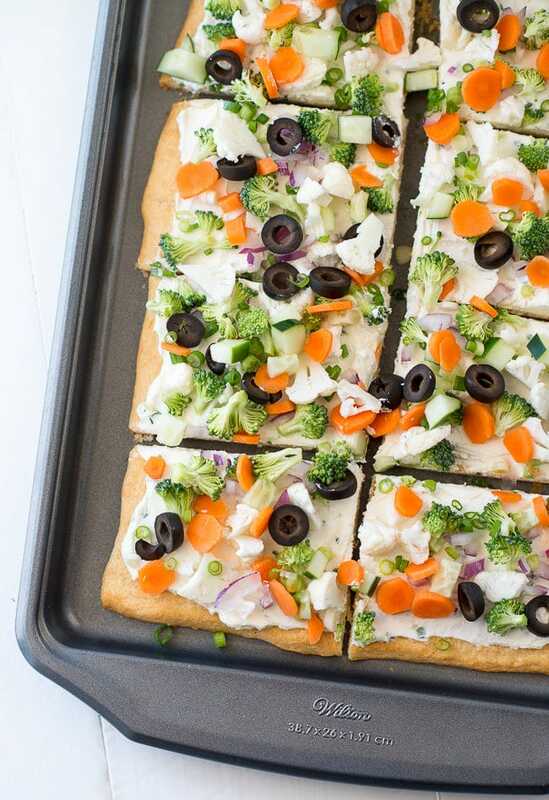 It’s true, when you cut your veggie pizza into bite-size pieces, it’s really the perfect finger food. Cut the pieces a little larger and this recipe actually works well as a fun family meal. Just ask my husband and kids! Of course, one of the best things about this crescent veggie pizza recipe is its versatility. Don’t like onions? No problem, leave them out. Rather have sliced cherry tomatoes on your pizza? Great idea! 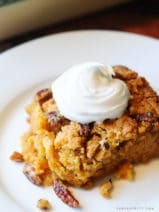 You can truly mix this recipe up in so many different ways. You could even let the kids get in on the fun by allowing them to sprinkle their toppings of choice on different parts of the pizza. Were cold vegetable pizzas like this popular when you were a kid, or is it just a local favorite in my area? If you’ve never tried it, you must! 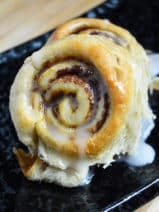 Love crescent roll recipes? 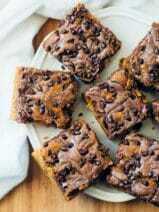 Check out the Pillsbury The Big Book of Easy Baking with Refrigerated Dough. 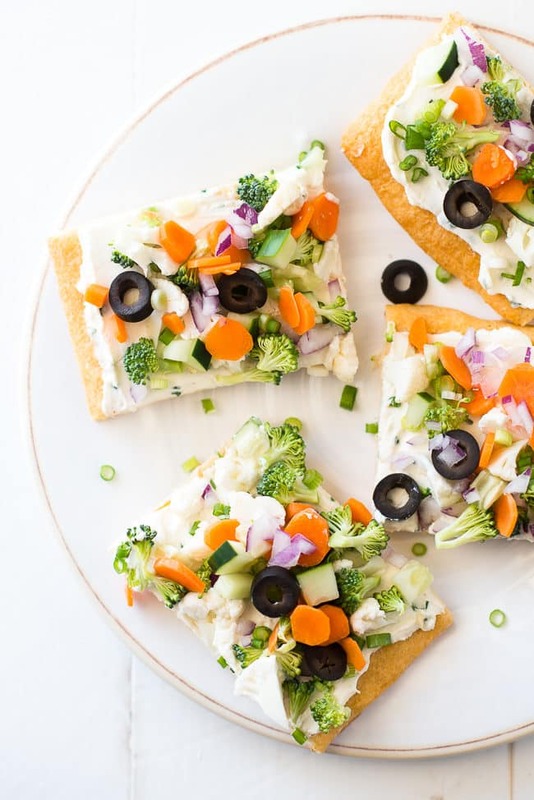 The ultimate party food, these cold vegetable pizza makes the perfect appetizer or a fun family meal. Preheat oven at 350 degrees F. Unroll crescent rolls, flatten, and press triangles together. Bake for approximately 12 minutes. Using mixer, combine cream cheese, chives, Greek yogurt, ranch dressing, onion powder, and garlic powder. Remove crescent rolls from oven. Let cool. Add a layer of cream cheese spread to crescent rolls. Sprinkle red onion, green onion, cucumber, cauliflower, broccoli, carrots, and black olives. 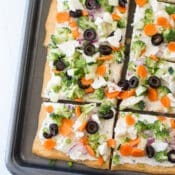 Cut veggie pizza into bite size squares for appetizer, or larger slices for a meal. 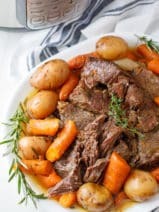 Serve right away or refrigerate for 30 minutes and serve cold. This worked great at a recent party and it was great! It replaced the feeling that we always had to have pizza for these kind of events. 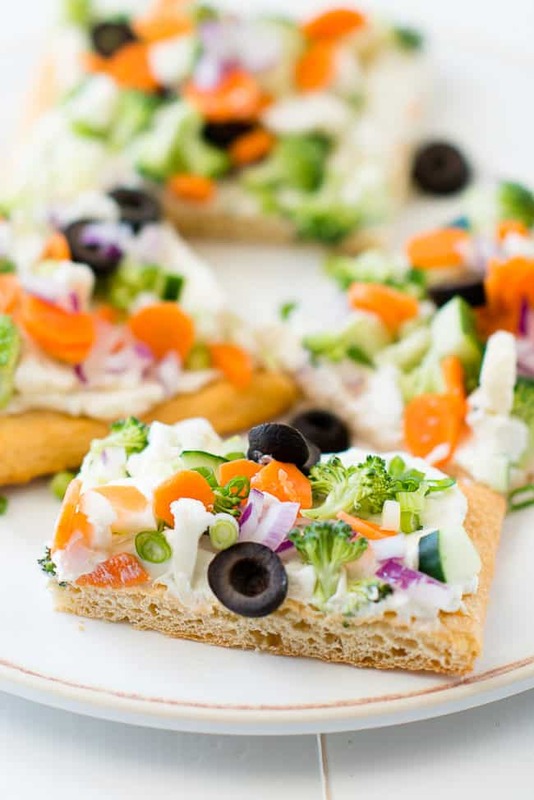 Loving the idea of a cold vegetable pizza – never tried anything like it before!